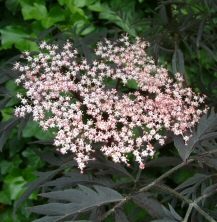 The Black Lace Elder (Sambusus nigra 'Black Lace') is a very pretty small tree, ideal for the small garden as it only grows to 3m (10ft). Black Lace has striking purple foliage with lovely pink flowers. These flowers are fragrant. Dark purple or black coloured elderberries follow in late summer to autumn, ideal for those who like to make wine. This tree is best suited to either full sun or partial shade. Black Lace elder is supplied at a height of 125cm in a 12 litre container, which means that the tree can be planted any time of the year and with better results than either bare-root or rootballed trees.